On 04 February 2018, I traveled to Buffalo Airport, USA to pick up Reshma Sameer, daughter of Veteran Brigadier Azad Sameer. To read more about Brigadier Sameer,Please Click Here. Buffalo Airport is 160 km from our home, about two hours of drive by car. She was scheduled to land at 2 PM. It was snowing in the morning and was foggy. Hence, I left home by 10 AM, catering adequate time for a slow drive, breaks, and crossing at the Canada-US border. We generally cater for about 30 minutes for border crossing formalities. As I pulled up at the US Customs & Border Protection counter, there was hardly anyone waiting there to cross. I drove up to the counter and the officer manning the post came out. As I was handing over my passport he asked “Sir, aren’t you watching the Super Bowl?” “I am off to Buffalo Airport to pick up our family friend” I answered. Returning my passport he said “Drive safely, have a nice day, Sir.” This quick clearance must have been due to the ‘Veteran’ Licence Plate of my car. The Super Bowl is the final game of the National Football League (NFL), played on the first Sunday in February. It is one of the most watched TV event in United States with more than 100 million people from the United States alone watching it. Every year the TV commercials, known as Super Bowl ads attract a lot of interest and also money. This year it featured Hollywood stars Cardi B, Tiffany Haddish, Keanu Reeves and Morgan Freeman. This lounge was setup in 2016 by WNY Freedom Lounge Inc in recognition of sacrifices by the US Military Service personnel. It ensures a welcoming environment for traveling Military personnel & Veterans at the Buffalo-Niagara International Airport. The lounge is open to members of the military, veterans and their families free of charge. WNY Freedom Lounge Inc is a private, non-profit organization, headed by Veteran Lieutenant Colonel Dan Walther of Kenmore, who raised funds and made arrangements for the lounge. The lounge provides morale and recreational services to members of the US Military and their families. The lounge offers comfortable seating, reading material, TV, phone, snacks, and internet access. It is staffed by veteran volunteers, veteran organizations and military supporters. I was welcomed in by Veteran Chief Petty Officer Ronald of the US Navy. After exchanging usual pleasantries, he ushered me in and showed me three rooms – a reception area, a kitchenette and a small living room with sofas and chairs. He opened the fridge, well stocked with beverages and asked “What would you like to have Sir?” “Black Coffee” I replied. He brewed a cup for me in the coffee maker and we sat down and talked. 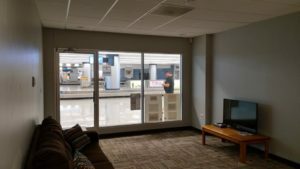 He said that this lounge has been created for transitioning Military personnel, who often have significant wait times between connecting flights. Most Military personnel often travel alone and they need a place to rest. The lounge is staffed and maintained fully by volunteers. It is generally open from 9 AM to 10 PM and during other times, the Information Desk staff would open it. We spoke about all matters two Veterans would speak – about our service in the Forces, places served, family, children, aspirations, dreams, et al. At the end I realised that we Veterans – from US and India – why from world all over – speak the very same language. The Military is in our blood and it cannot be shed easily. An excellent and noble job of a Lounge for Mil. Nice post. Nice to see the idea of veteran’s fraternity operating trans borders and across oceans. Reji, enjoyed reading. Simple, straight and genuine with personal touch. I agree veterans have a lot of things in common. I worked with Pearson after Army career. We had veterans group on our intranet with members from 34 countries. We often discussed common topics and had a great bonding.